It’s a plus when a home comes pre-equipped with spectacular outdoor kitchen amenities. Today’s homebuyers want their porch space back, and plenty of it. It’s important for outdoor living spaces to be comfortable -- all year long. No matter the climate, homebuilders are seeing value in creating highly functional outdoor areas that can make a home more appealing to potential buyers. Even in southern states where summers are long, hot and humid, many homebuyers are looking for an outdoor living space where they can relax on the front porch with a cocktail or host a backyard barbecue for friends and family. And they’re willing to spend extra for it. In the neo-traditional community of Oakland Park in Winter Garden, Florida, homebuilders J&J Builders, Ashton Woods Homes, Vintage Estates Homes, David Weekley Homes and RCB Homes offer a range of features that allow residents to take full advantage of their outdoor living spaces. When weather permits, many families enjoy cooking and sharing a meal outside for a change of scenery. 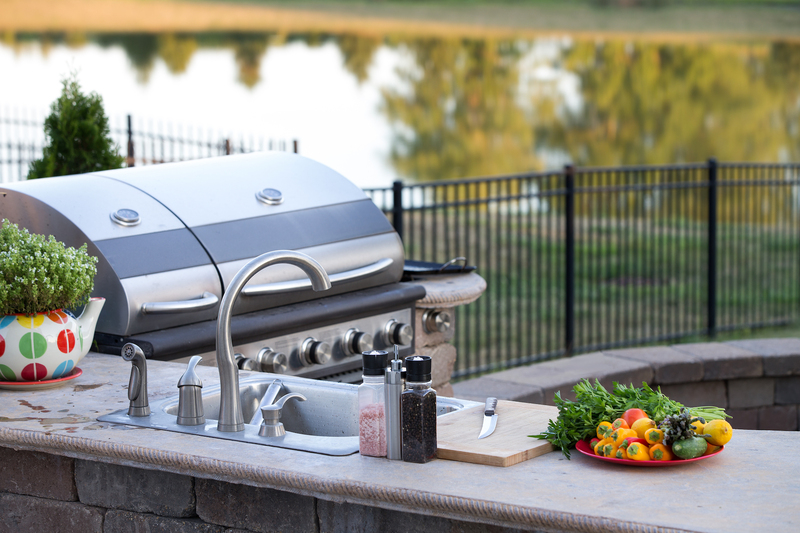 Although a basic grill and a picnic table once were the norm, many homebuyers are now looking for full outdoor kitchens outfitted with built-in grills, stainless steel appliances, ice makers, granite countertops and islands. Some homebuyers are willing to spend time and money retrofitting basic backyards to meet their outdoor cooking and dining needs after they move in, but it’s a plus when a home comes pre-equipped. It’s been decades since sitting on the front porch and visiting with neighbors was a routine evening activity. In recent years, however, a number of homebuyers have grown nostalgic for rocking chairs, porch swings and the front porch culture that was long a characteristic of small towns. Simply put, today’s homebuyers want their porch space back, and plenty of it. At Oakland Park, the builders have realized this, and each of the builders includes ample porch and lanai space in their homes. In fact, Vintage Estates’ new lakefront model has nearly 2,000 square feet of porch space. For many homebuyers, space to host family and friends is a necessity, and with the right features, an outdoor living area can be the perfect spot for this. Homebuilders at Oakland Park such as David Weekley Homes and Ashton Woods provide large lanais with room for seating, bars and TVs. It’s also important for outdoor living spaces to be comfortable — all year long. This is where amenities such as outdoor fireplaces come into play — providing a cozy atmosphere for mingling with dinner guests or roasting marshmallows with the family. To keep these spaces cool in the summer, it has become increasingly common for residents to install oversized ceiling fans and even misting systems. Many residents also prefer screened-in patios to keep bugs away. It’s important for outdoor living spaces to be comfortable — all year long. As homebuyers make the decision to invest in making their outdoor living spaces functional, comfortable and visually appealing, an important component is incorporating large windows and doors to visually connect the exterior with the interior. We have seen that residents enjoy sizable windows that create airy, natural-lit spaces, as well as double doors leading out to lanais and patios. In Oakland Park, this provides residents with views of the multiple lakes, ponds, pocket parks or common open spaces. These are the top outdoor space trends we are seeing. What are you seeing in your market? Please share in the comments section below. Thom Cunningham is Vice President of Crescent Communities, the developer of Oakland Park, a neo-traditional community in Winter Garden, Fla.